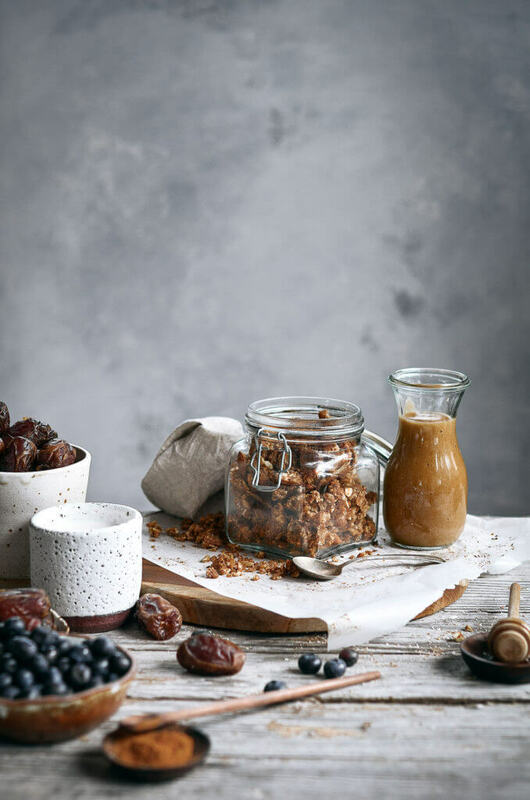 Easy grain free and paleo cinnamon date granola. Made with toasty coconut and nutty infusions and cinnamon spice. Sweetened with pure medjool dates. Made in minutes! I asked, you responded. I wanted to know what breakfast recipes you wanted to see on the blog. Consensus was ANYTHING EXCEPT EGGS!! Hahahah, I totally get it though. 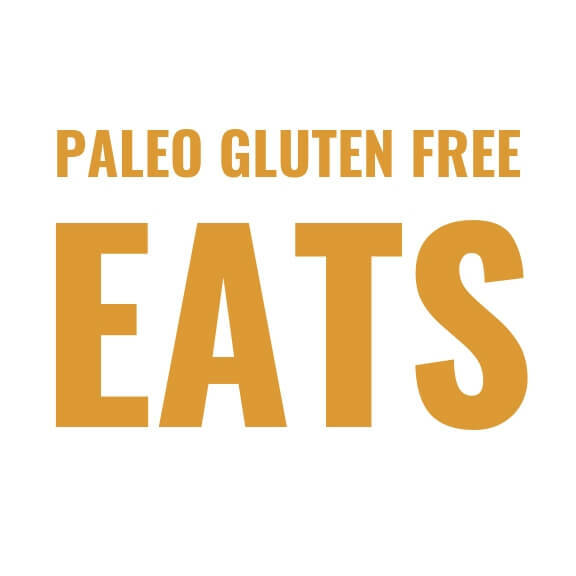 Eating healthy/paleo can seem more like eggs everyday. Instead of thirty days of eggy breakfasts I decided to mix things up. The result was a nutty cinnamon crunch straight from heaven. P.S. I also have a recipe for cauliflower pancakes on the docket, so stay tuned :). 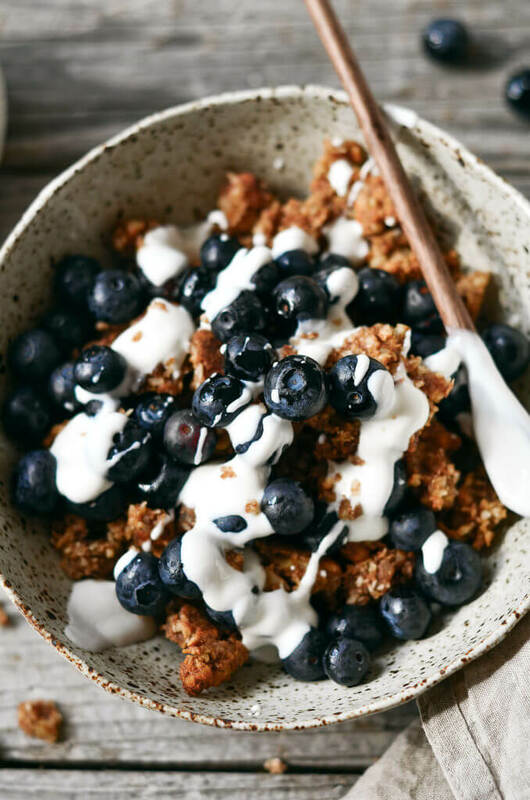 This granola is perfectly paired with a handful of fresh blueberries (or any other fresh berries you have on hand).Top with canned coconut milk- it’s thick and is like yogurt (make sure to combine before using)! Or you can make a paleo yogurt recipe. whole30 date granola coming up! 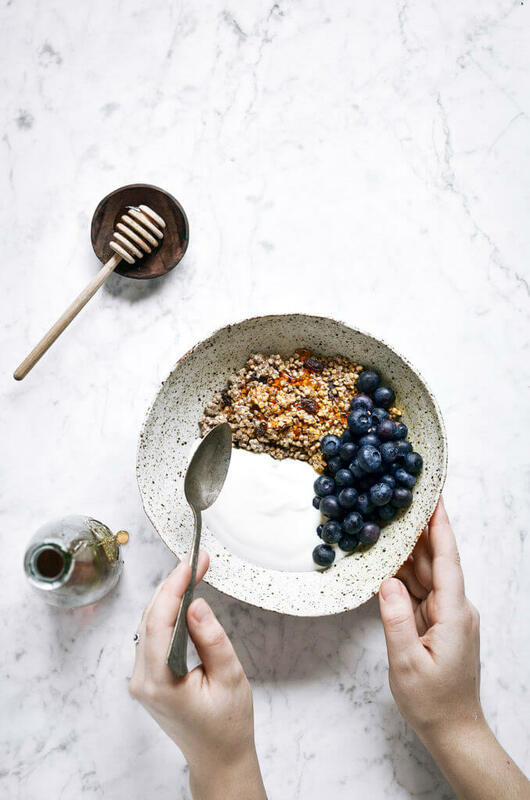 This week I was experimenting with different paleo granolas, eating all kinds of other breakfast cereals (picture below- just in case you were curious 😉 ) Also, missing too many veggies thanks to cereal! But, oatmeal free granola! I didn’t even know if it was possible. Like, how do you make granola without grains. And granola without using honey or maple syrup- I was going to have to work on that! Turns out it’s possible. 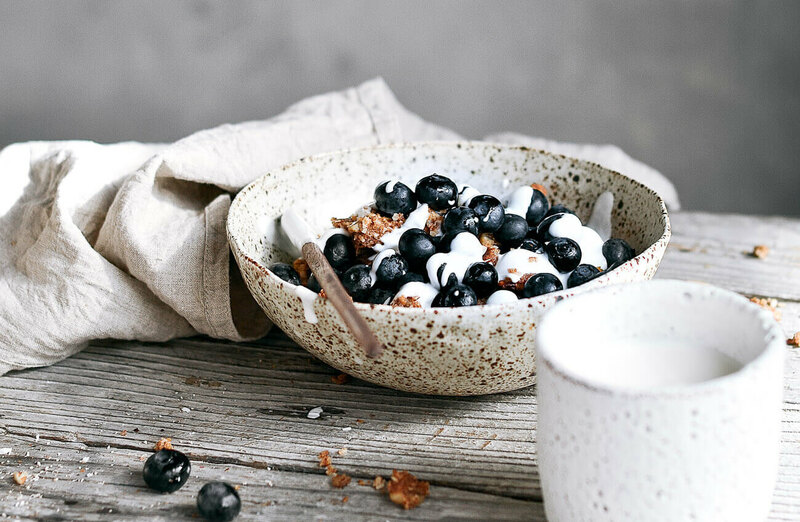 One of my favorite things about this healthy granola is how fast it is to make (20 minutes). Hope you enjoy! Top with canned coconut milk- it's thick and is like yogurt (make sure to combine before using)! 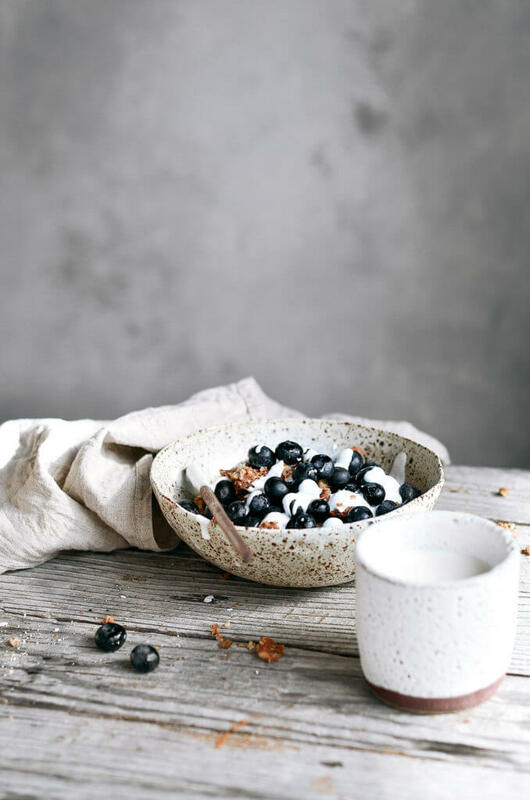 Or you can make paleo yogurt recipe. You can also add chopped date pieces into the granola if you want some more texture and flavor. In a food processor pulse the almonds into small pieces. Then add in the rest of the ingredients and pulse until it reaches your desired consistency (you can make it more crunchy or smooth depending on how you like it). Once the granola is pulsed add in chopped date pieces if you want. 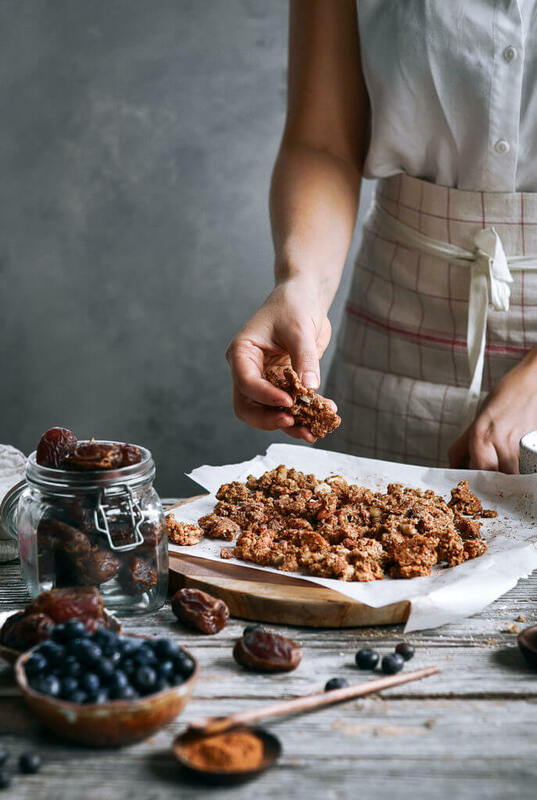 Spread granola out on a baking sheet lined with parchment paper. Bake on 300F for about 20 minutes or until golden. This looks SO delicious, but am I reading the nutrition right? Almost 700 calories and 24 g of sugar for ONE serving?! How large is a serving, about 1/2 a cup? Was admiring your photos and recipes, and since going gluten-free (due to stomach issues) was going to try this Whole 30 granola. Have you come up with a corrected calorie and sugar count? This still says 696 calories per serving. Is that really correct? I’m looking for healthy recipes, but a serving of granola coming in at 696 calories doesn’t seem healthy at all. Can you please tell me what the 1/2 cup Whole 30 date syrup is that you have listed in the ingredients? Thanks! Hi Kaylie! Made this for the 1st time today and YUM! Had this with sugar-free vanilla almond milk and blueberries. I miss cereal so much since I went predominantly paleo. Now that I have this, don’t need to miss it anymore. Thank you for sharing…healthy, filling and delicious! Hi Kaylie, I was so happy to find this recipe! I don’t see a “get here” box next to the Whole 30 date syrup. Can you please point me in the right direction of this? Look delicious but sadly is not Whole30 compliant. 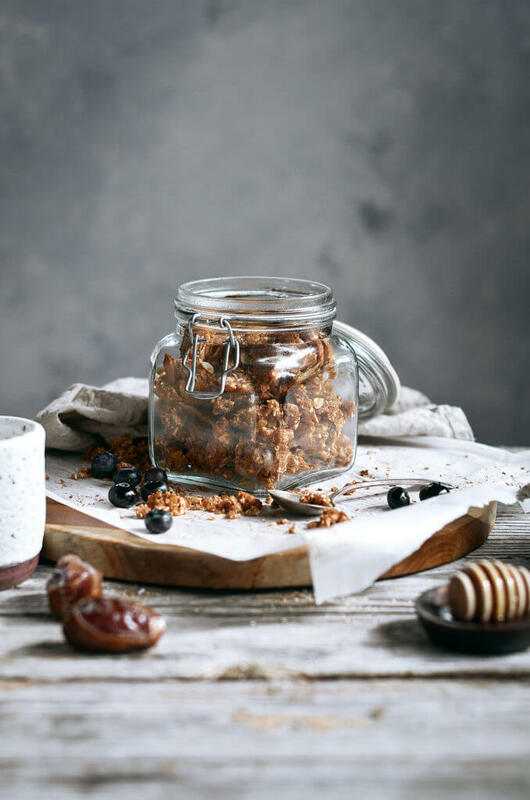 Melissa specifically states that we are not to recreate any cereals and are not to use dates as a sweetener for anything. This really leads people astray from the program. Perfect for after your Whole30 during Food Freedom but definitely not Whole30 compliant per Melissa Hartwig. Please let me know how much a serving is- 1/2 cup?